Tyler Rogers is pursuing the new music degree to help him realize his goal of becoming a church music director. 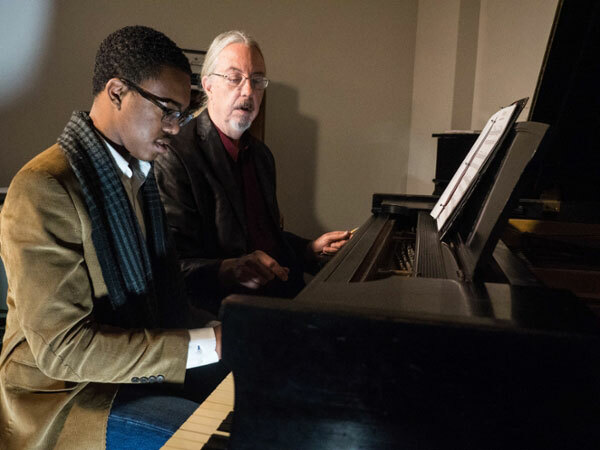 He takes piano at MGA from Jim Penndorf, right, one of the music program's talented adjunct faculty members. Photo by Jessica Whitley. A new MGA bachelor's degree rethinks what music majors should learn to thrive in the cultural economy. For Tyler Rogers, pursuing a dream of becoming a church music director means getting down to business. "I want to know how to copyright my music," said Rogers, 20, a Middle Georgia State University sophomore from Macon. "I want to learn the logistics of producing. Those things are important for a director in a church music setting. It's not just about making music." That's why he plans to apply to Middle Georgia State's new Bachelor of Arts in Contemporary Musicianship, which the University soft-launched this spring. The program - one of a kind in Georgia - is designed for students like Rogers who want music-related careers but would benefit from a more entrepreneurial focus to their education. Reflecting a partial shift away from the traditional emphasis on a classical music curriculum, the B.A. in Contemporary Musicianship seeks to "train musicians to capitalize on the artistic product by delivering skills in marketing, entrepreneurship, and non-profit management," according to a formal program proposal written by Dr. Rebecca Lanning, MGA's coordinator of Music. Students pursuing the degree will be able to choose between two emphases: classical, which retains much of the traditional approach but with some enhancements, and commercial, designed to train students to apply correct musical technique to various forms, including hip hop and R&B, two of the world's most popular forms of music. "We wanted to develop a program that students could build upon to enter more wide-ranging careers than those typically afforded by a traditional music degree," Lanning said. "The cultural and entertainment marketplace in Georgia is substantial. In Macon and the surrounding area alone, church music represents a huge part of the job market. "Our approach to development this degree was to create something that will allow graduates to move between the various cultural marketplaces." The genesis of the B.A. in Contemporary Musicianship lies in Lanning's doctoral dissertation, which she completed in 2015. Via email, she surveyed nearly 5,000 music faculty throughout the Southeast to get their opinions about the relevancy of music programs in higher education. Among Lanning's discoveries was that many music faculty believe career opportunities in the classical world are scarcer than they once were. A majority of those surveyed think teaching non-musical skills is as important as teaching musical skills to music majors. (They also believe that the kind of non-musical skills students in those programs need has significantly changed in recent years.) Many agreed that there is a big difference between teaching students to be musicians and teaching them how to create musical careers. "In general, music programs haven't really taught students how to identify and find all the ways they can earn a living," Lanning said. "We haven't taught them how to self-market, how to develop that whole entrepreneurial piece to help them navigate an industry that, as far as making a living, significantly changed after streaming services like Pandora hurt music download sales." The message resonates with Rebecca Gaw, a Middle Georgia State student from Warner Robins who plans to apply to the new music program. Years ago, Gaw, 35, gave up playing the saxophone, her "first love." The reasons went beyond uncertainty about how to make a living, but it's notable that when her children were old enough for her to start college as a non-traditional student, she went for a "practical" accounting degree instead of something music-related. "I liked accounting, but it didn't speak to me like my music did," Gaw said. She had picked the sax back up after 17 years of not playing, and as word of a potential Middle Georgia State degree in music began to spread she transferred to the University from another area college in fall 2016. Gaw now plays sax for the jazz ensemble of MGA's Band of Knights and is planning to pursue a music-related career, perhaps in teaching, although she'll have to earn a master's degree to do that full-time. She already has a part-time job teaching woodwinds at an area middle school. "I'm not in a position right now to move somewhere else to get an affordable music degree," Gaw said. "This came along just in time. It's like God put it right here in front of me." The degree launch follows last year's decision by University leaders to expand band instruction and facilities on the Macon Campus. Now housed in larger space in a building adjacent to the Student Life Center, the Band of Knights and its various subunits, like the jazz ensemble, are poised for growth. "The majority of Middle Georgia State students who want to participate in band programs take classes on the Macon and Warner Robins campuses, so consolidating instruction at a single, more convenient location gives them those opportunities and makes it more feasible for them to pursue the new degree," said Dr. Alan Clark, MGA's director of bands. "They'll be able to learn more about the music industry that supports bands in America." Clark is one of four full-time music faculty at MGA, but the program is also supported by a cadre of devoted adjunct instructors. One of them is Miguel Castro, percussion coordinator and band assistant. Castro is a composer, arranger, and recording artist who has performed with various professional orchestras in the U.S. and abroad. With help from Clark and Castro, MGA student Luke Ross, 21, of Byron gets regular paid work playing the drums at gigs around the region. With Castro, he sat in once with the Latin American Orchestra of Houston, Texas. Ross also teaches percussion part-time at two Houston County schools. Ross at one time wanted to be a studio musician and performer but he is now, like Gaw, interested in teaching full-time for a high-school band program. He's been at Middle Georgia State for a while pursuing a two-year degree in music the University is retaining while it builds up the new bachelor's program. "I was literally about to transfer to another university to work on my bachelor's," Ross said. "Now I don't have to. I'm excited I can continue to work with Miguel, who is the best percussionist on the planet." Other full-time faculty are Lanning, mezzo soprano, who has performed in recital, opera, and oratorio throughout the U.S. and in France; Tisha Simeral, bassist, a touring musician who has performed for more than two decades with a variety of artists; and Dr. Robert McIntyre, chair of MGA's Media, Culture, and the Arts department, where the music degree is based. A tenor, McIntyre performs musical theater around the region. A search for a fifth full-time faculty member is underway. Lanning said the ideal candidate will be a pianist with expertise in classical forms and experience in other genre. Although a more formal launch of the music degree doesn't take place until the fall, the program is already getting attention outside of MGA. A newly created advisory board for the degree program attracted some big names, including Joey Stuckey, an award-winning guitarist, songwriter, singer, composer, and producer who owns Shadow Sound Studio in Macon; Georgia Music Hall of Fame inductee Alan Walden, a music manager, publisher, booking agent, promoter and, with his brother Phil, co-founder of Capricorn Records; and Emory Gordy, a 1964 graduate of the former Middle Georgia College, now MGA. Gordy, also a Georgia Music Hall of Fame inductee, went on to become an influential figure in the music industry as a studio and touring bass player, as well as a producer. He worked with Elvis Presley and Emmylou Harris, among many other well-known performers. Meanwhile, Lanning is hearing from potential students in Atlanta and elsewhere. "We think this degree will draw from throughout the state and even outside of Georgia," she said. "There are a lot of people out there with musical street cred but no degree. This program lines up well with what they are already doing." For Rogers, the student aiming to become a church music director, pursuing a music degree that also focuses strongly on career development means he can push back against the naysayers who think he won't be able to get a job. "When you tell people you want to major in music, some of them say things like, 'No, you need to major in computer science,'" he said. "But that just wouldn't be me." Overview: During the first two years of applied study, students receive classical training using historical best practices. In the junior and senior years, students will explore different styles, from classical to gospel to R&B to country. This approach is designed to help students to musically communicate with diverse culture while giving them a competitive edge in the industry. MGA's music program will hold a major annual event to showcase the work of its students. Degree Concentrations: Classical Study or Commercial Study. The B.A. can also serve as a gateway to a Master of Arts in Teaching, which provides a path to teacher certification in music. Performing: MGA's music program supports the Brass Ensemble, Chamber Singers, Classical Guitar Ensemble, Jazz Band, Marching Band, University Band, and Woodwind Ensemble. Coming soon: Commercial Combos, Gospel Choir, University Choir. Auditions: Take place after the application process is completed. Contact music auditions@mga.edu. Still Available: The Associate of Arts in Music, which does not require an audition. This article originally appeared in the spring 2018 issue of MGA Today magazine. The online version of the magazine contains more photos related to Middle Georgia State's music program.